Classic, Glamorous and Affordble: Rhapsody DIY Holiday Invitations. What more can you ask for? 100% cotton rag 105 lb bright white cardstock with rounded edges. Fits in standard size #10 envelope, but our envelopes are anything but standard! The pearlescent silver envelope announces the importance of your event. 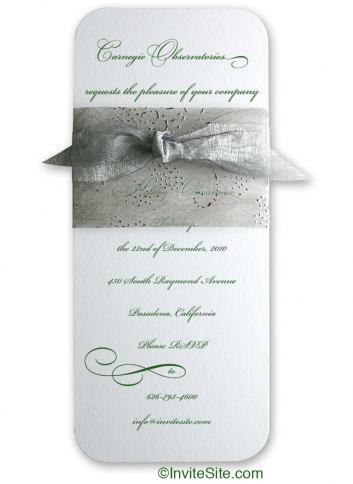 This invitation is an elegant little gift: wrapped with an embossed silver pattern bellyband and organza silver ribbon. Assembly: super easy. Rounded edges on matte finished 100% cotton heavy cardstock. The bellyband and organza ribbon tie add just enough flourish. Simply stunning, We can print for you in Moss green, midnight blue, silver, gray, deep black, or dark burgundy ink. Kit includes a silver pearlescent envelope from paper made in Italy. Finished invitation measures 9 x 3Â·7/8th inches. Mailing Envelope:Silver pearlescent #10 size envelope.